Well, it’s not like I didn’t have enough early warning. 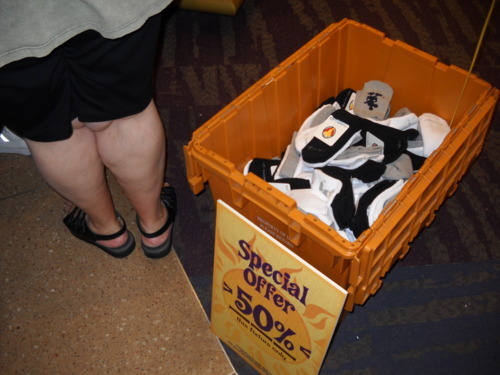 …and don’t forget our Annual Passholder’s Sale at the World of Disney, coming up on July 23rd. Eh, two and a half months away, what would I worry about? 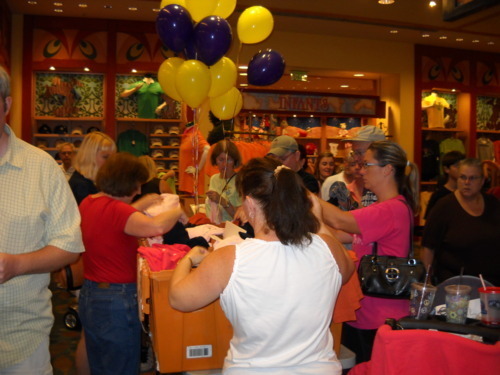 Don’t forget about the Annual Passholder’s Sale! July 23rd, 6:30 a.m. to 9 a.m.! Great Savings! Doorbusters from $1! You Don’t Want To Miss It! Excuse me… Did that say tomorrow? As in “the next time the sun clears the horizon” tomorrow??? Ah, fudgesicles. I know what I’m looking at – A three-hour window into the Ultimate Disney Store with great prices, and limited access merchandise on a first-come, first-serve basis. We’re talking full-on retail piranha time. It’s like Black Friday, only in July and with no turkey sandwiches. And of course, I’m reading this at 7 p.m., with the full knowledge that if I intend to do even reasonably well, I need to be in that parking lot before the doors open at 6 a.m. The sale is straightforward. To gain admittance, you either have to be a Disney Vacation Club Member/Owner or a Walt Disney World Annual Passport Holder. Actually, on this last point, I’m a little unsure. 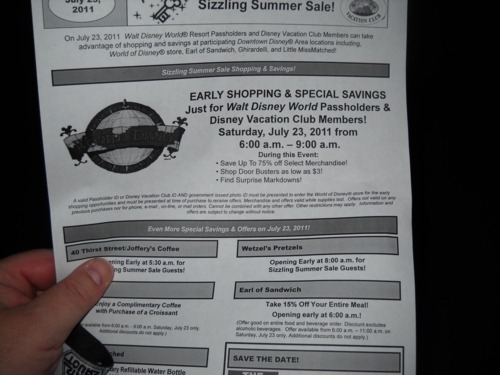 They held this sale on both coasts (it started in California thirty minutes after the one in Florida ended) – and I wonder if you held a Disneyland Annual Passport and showed up at the World of Disney in Florida, would you have been let in? It turns out I do know who to ask – more on that in a bit. So, with a too-brief nap of only three hours, I finish up a couple of paperwork things around the house, then head off eastbound on I-4 to Walt Disney World. There’s a thing about driving that early in the morning to Walt Disney World. There’s almost nobody on the road in Florida. As long as you can avoid the big rigs (who, figuring there’s nobody in the way, will barrel along at close to 90 and blow by you in a rush of wind and fury, their pressure waves threatening to toss your cars into the weeds), it’s pretty peaceful. But when you approach Lake Buena Vista itself, conditions changed. What I ran into was traffic. Specifically, people headed for the sale, who reminded me once more that I’m in the south now, home of NASCAR. This is the land of people who live by the words, “If the paint’s not rubbin’, it ain’t racin’.” Roughly translated, this means folks on a mission, who believe that if they don’t beat you to a spot in line at the World of Disney, that bauble they want may not be there. Let’s just say the driving was a wee bit more intense than I prefer. But I managed to get into the parking lot without any paint removed from my vehicle by letting others go ahead of me. I might have some things I’d like, but I’m not desperate for this sale – just curious as to what’s here. So, once parked, I’m out of the parking lot and in line in front of World of Disney. Or, rather, in back of World of Disney. 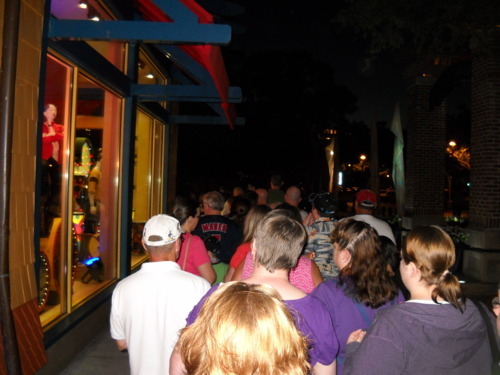 Yes, the line stretched all the way around the store when I arrived at 5:30 a.m. – a half-hour prior to opening. I was not surprised. I expected this. Curious about the sale, I ask the ladies directly behind me in line. I asked them their names, but when the line started to move, I neglect to write them down (I apologize ladies, and if you e-mail me or mention them in the comments, I will update the entry to correct this egregious error). They advised me what I would face – huge crowds, frantically surging from point to point, in search of specific items. I was able to share in close to real time a post about what was going to happen. If you were following along, I hope you found that useful. Coffee and a croissant? I was so there. After 15 minutes, my section of the line finally entered the store, and into the feeding frenzy. If you’ve shopped a Black Friday, you’ve had the experience. Big crowds clamoring for things, people grabbing multiple items, greed and avarice on display. Not so fast. There was a strange, Disney twist to all of this. The castmembers who worked on this, for the most part, were unfailing nice. At least, they were when dealing with me. Of course, I think they were amused that this big round guy who looked like Santa Claus on summer vacation wanted to chat them up rather than buy something in the middle of this retail extravaganza, but they were great sports. One castmember, Joseph, from Danbury CT, was so helpful and we enjoyed a great conversation. He dreams of working at World of Disney while finishing school, then going on to become an animator and working for the company, either with Pixar or Walt Disney Feature Animation Division, making movies for people to enjoy. His most insightful observation? All the magic going on around us was inspired initially by magic that happened on the screen, both big and little. He wanted to help make some more. Someone like that, just stocking shelves in the stores? Incredible. And not for long, I hope. Someone with dreams that big needs to go very far, indeed. 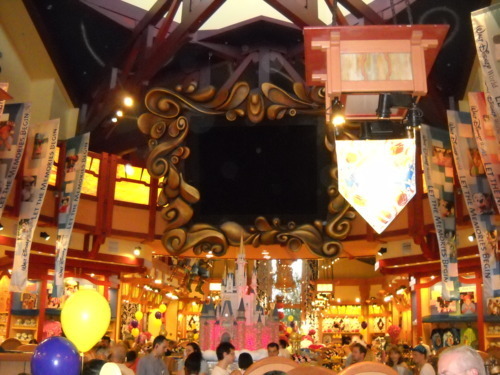 Typically, the World of Disney store plays Disney film clips and music while you’re shopping, getting you in the proper Mousely mood. I noticed this wasn’t happening, and assumed it was due to the nature of the sale – we were already getting great deals and needed no additional motivation. Not true. I was able to have a great chat with Beverly and Steve, two castmember managers, and brought up the subject during our conversation. It turned out that the giant video screen was disconnected because it is in the process of being replaced by an even larger HD video screen, due to be installed sometime in the next two weeks. 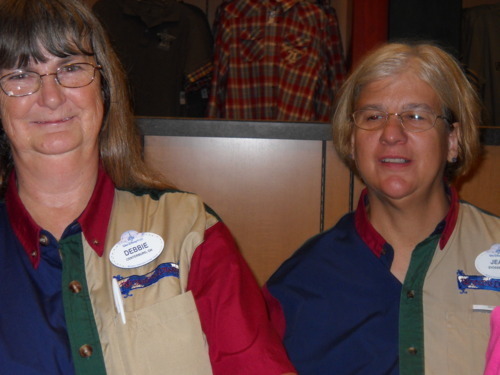 Debbie and Jean, my friendly checkout castmembers, who had seen me after having dealt a continuous stream of people for over 90 minutes, asked me for my annual pass, and then immediately reminded me that in addition to all of the bargains, I received an additional discount as a premium annual passholder. It is good to be the King – and even better to be treated like one! So after all of that, I escaped from the crowds with only a couple of bags and retreated into a corner to watch. It was amazing watching the people descending on any of the sale displays. The image of a cow dropped into a pool filled with piranha came to mind. But maybe I’m a bit naive. I’d like to think that the reason each person was there was to try and get something nice for some people in their lives, maybe take advantage and get some early holiday shopping done. As I exited the store, I asked Sue, the castmember handling the door, what the count was. It turned out it had just passed 2500 guests. That’s an impressive size for an invitation-only sale. After I exited. I ran into another group of very happy castmembers. The first was Amy, who was the Merchandising Development Marketing Analyst… and I think I might have just screwed that up. Amy was there to monitor the success of the sales at both World of Disney locations, yet was still able and gracious enough to take the time to talk to me about how specific items were chosen for inclusion within the store as “doorbusters” (remember those socks – surprisingly, not just based on inventory levels). I hope, if the opportunity arises in the future, to follow up with her in the future and learn more about how Disney merchandising makes decisions – it really sounds fascinating! The Benefit Sale, a ticketed event sale at Downtown Disney with ridiculous bargains throughout the Marketplace, with proceeds going to local charities. That one will happen on November 5th. 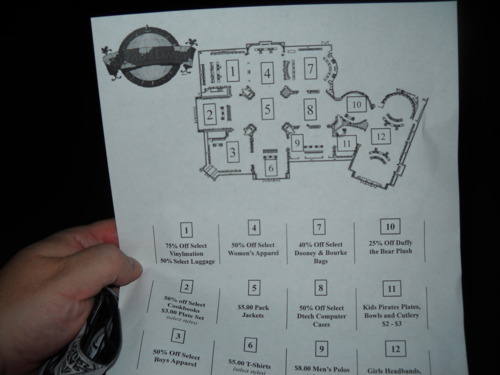 Additionally, any merchandise events surrounding the Food and Wine Festival falls under their purview. See what I mean – they get to plan cool parties for lots of people in one of the most excellent places in the world. It’s great work if you can get it. I bid farewell to these ladies as their duties took them elsewhere and decided to grab breakfast. As I noted earlier, Ghiradelli was offering a free cup of coffee with the purchase of a chocolate croissant as part of the sale festivities. A little continental nosh sounded good, so I stepped next door, ordered up, paid my $3.00 and waited. When my number was called, I was handed a paper cup and two croissants. Deux croissants? I looked at the young lady quizzically. I checked my watch. 8:55. The girl behind the counter winked at me and moved on to the next customer. It was just that sort of day. So, as I sat outside by the water, eating my croissants, drinking my coffee and looking over at the World of Disney, I thought about the people I’d had the chance to meet that morning. What a lucky man I’ve become.